I have checked the form(formID: 63363449763465) and I also checked your pre-population link. Please check. If the issue still persists, let us know. 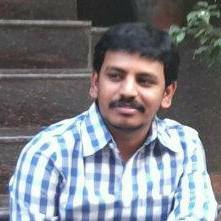 This link is prepopulated and is created by you team on December 16, 2016 at 07:20 AM. This link has to generate automatically after a submission is received in 1st Form. 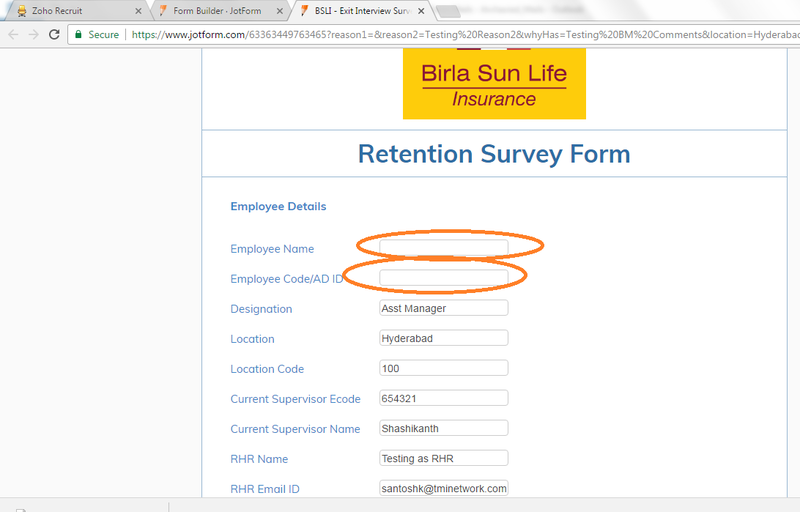 But as you reply says you have edited manually and typed BSLI MIS for Employeename. But i can't edit them manually for all the submissions. I request to arrange a call as there is some misunderstanding of my query or your response. Sorry for the misunderstanding. I did not check your previous threads. I was trying to check your form again now and I have seen that you have set all the fields as read-only as you can see the following screenshot. Moreover, I am not able to clone your form in order to test it on my side as you have enabled the option of "Do not allow my forms to be cloned by other users." I have tried this link on your thank you page and I have seen that this link works perfectly. In your link, the fields of employeeCodead and employeeName have been set as EMPTY. So that, it is normal that the fields will look empty in the form. You do not need to use different pre-population link for each submission. I recommend you to use the pre-population link that my colleague Owen has given you. In addition, I think you have deleted the pre-population link from your form as I could not find where did you use it. However, if you use that link that we have recommended you in your autoresponder email or in your thank-you page, you will experience that it will work. Please check again and if you need any help, let us know. We can not see the response you have been sent here. I have tried multiple times to respond pint wise and getting a blank window as per submission. I am not able to report. Please share alternate email ID or other ways of replying for the same. Providing below the point wise response from our side. Before that I thought of explaining our requirement. In Form 1 all the fields can be be filled and an automail triggers to concern person with an edit link of Form 2 and here all the fields of FORM 1 will be pre -populated in FORM 2 which are read only. Then the concern person can read all the fields(of FORM 1) and update his remarks in FORM 2 which ever are not Readonly. Once the FORM 2 is filled again an automail trigger to concern person with edit link of FORM 3 here again all the fields of FORM 2 will be pre-populated in FORM 3 which are read only in FORM 3. Now the concern person can read all the fields(Read only) which are pre-populated from FORM 2 and updates his comments in FORM 3 itself. Point -1 - Did you do it on purpose? Yes we done the fields as Readonly as the same should not be edited by second and third person. Point -2 - In your link, the fields of employeeCodead and employeeName have been set as EMPTY. So that, it is normal that the fields will look empty in the form. This is the actual issue. This is the FORM 2 and Above mentioned both the fields has to be updated from FORM 1 which is not done in FORM 2. Point -3 - You do not need to use different pre-population link for each submission. I recommend you to use the pre-population link that my colleague Owen has given you. I am unable to understand this. Please elaborate and suggest How can i do the same. 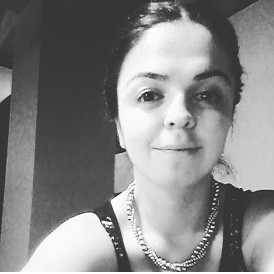 I have used the your colleague's link in Auto mailer. 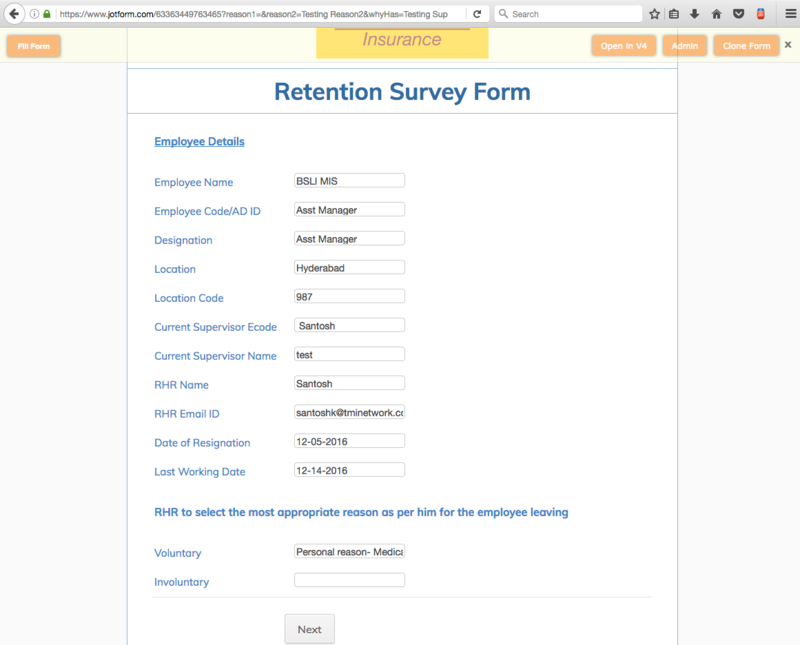 Point - 4 - I think you have deleted the pre-population link from your form as I could not find where did you use it. Please call me to below number if required any information from my side and arrange the resolution on priority. None of the fields on Form 1 is readonly. Your user first fill this form and submit it. Within the autoresponder, there is a link which is prepopulation link of Form 2. Right? All the field datas in Form 1 should pass to Form 2. The fields, which are prepoulated from Form 1, are read only on Form 2 except following part which is the last page on Form 2. These fields should be filled. All the field datas in Form 2 should pass to Form 3. The fields, which are prepoulated from Form 2, are read only on Form 3 except following part which is the last page on Form 3. These fields should be filled. If I'm correct about above things, could you please identify which fields are not populated and on which form? Since, I cloned 3 of the forms and some fields could not populate. As, the some of unique names changed when I cloned and I can not figured out to which fields I need to focus on, without your help. Thank you in advance for your clarification and understanding. Request to check once and let me know if any additional information is required. I checked the prepopulation of your first form to second, and updated the code accordingly. Employee name and code are populating successfully to the second form. I sent 3 test submissions to your first form, please delete them after your checking. 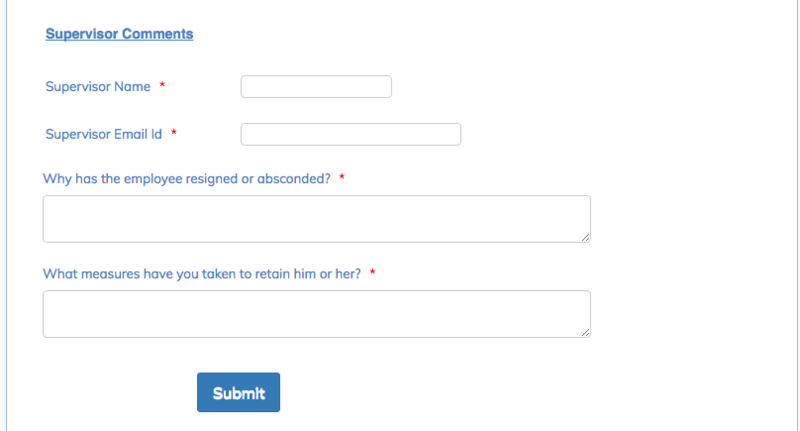 I updated your form, you don't need to anything now. Please check if it is working properly. If there are missing fields, please give us details about them wait for us to work on your forms. 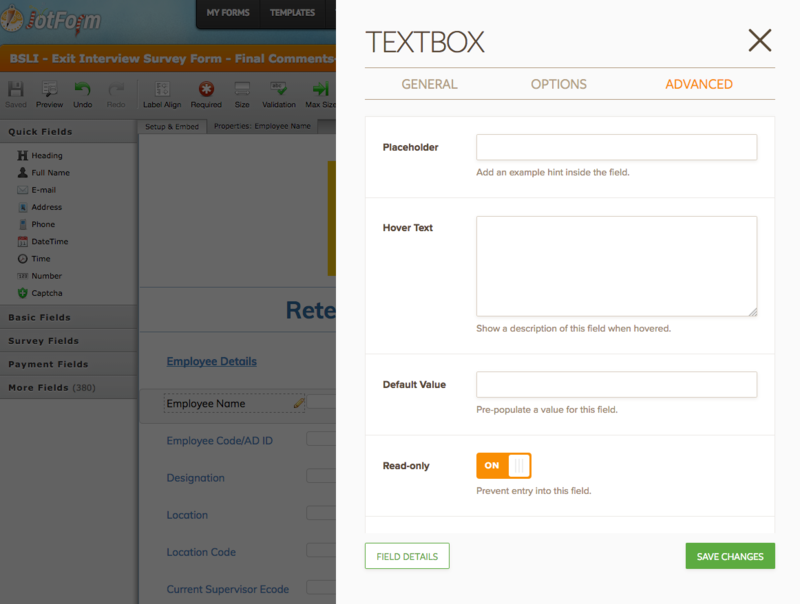 Please open a new forum entry for further missing fields of your prepopulating forms. 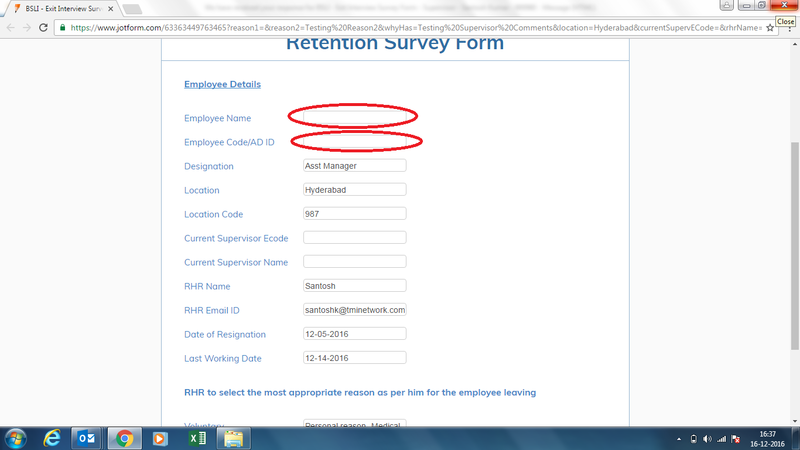 Thanks a lot for the solution Its working fine from Form1 to Form2 but while coming to Form2 to Form3, Employee name and Employee Code/ADID is not getting captured from Form2 to Form3. Request to check this also and do the needful on priority. I have updated your connection from From 2 to From 3. I sent a test submission and it is working properly. The red ones were wrong and were corrected. Please feel free to contact us for your further queries.